one | Publicly refuse to eat animals - live vegan. two | Publicly refuse to sit where animals are being eaten. three | Encourage others to take the pledge. Often when dining with others, we are forced to confront a disturbing reality: the corpse of a victim of violence on the dinner table. But this year, we’re banding together to push back against a violent tradition with the #LiberationPledge. Pledge to show respect for victims of violence, to demonstrate opposition to a brutal system, and to push all those around us to build a more peaceful world by refusing to eat animals -- or sit at a table where a victim’s body is being eaten. Be proud of this conviction - be open, honest and outright. 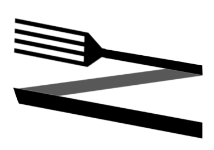 Wear a fork bracelet as a symbol of this pledge, and to show support for others who have taken it as well. Animal rights groups have investigated some of the most celebrated farms in the world, certified humane suppliers of animals bodies, and found unimaginable cruelty. While animal agriculture has attempted to justify using animals as humane, we know the truth: using animals is inherently violent. To show this truth to the world, however, we have to make a public stand and create social norms around the idea that animals are not ours to use. Refusing to sit where the bodies of victims lie, and publicly displaying your commitment with a fork bracelet, is a powerful way to do this. The historical campaign against foot binding in China struggled for 1000 years. Education, lobbying, and countless other methods made no traction in stopping what was (like eating animals today) considered a “traditional” practice. refuse to allow their sons to marry women with bound feet. These pledges, while initially difficult, grew like wildfire and, after 1000 years of suffering, completely ended the practice of foot binding. We can do the same for animals by refusing to participate in violent practices, but also refusing to accept violent practices in our community. WHAT'S THE FORK ON YOUR WRIST? Many taking the #LiberationPledge also make and wear a fork bracelet - a bracelet made from a fork bent to fit around a wrist. Why the fork? By bending a fork into a symbol of nonviolence - we reclaim a tool that is indirectly, the single tool most responsible for the immense suffering and unimaginable deaths animals endure. Effectively, we aim to "beat swords into plowshares". Want to learn more about the origins of this symbol? See our FAQ. Want to make your own? See our resources section. HOW DO I FULFILL THE PLEDGE? Sign up below. Join the community of people taking the pledge on Facebook. Share to social media. Tag your posts with #LiberationPledge. Feel free to use our sample public announcement. Make a fork bracelet. Make it, wear it and post an image of it online with the #LiberationPledge tag. Reach out. Explain to friends or family members who might expect you to eat with them that you’ve signed a public pledge. Use our sample scripts. Offer. Suggest an alternative vegan meal, or place to eat, that does not use the bodies of victims. Stay strong. Stay firm and nonviolent in the face of conflict, refer to our resources and seek out community support on our Facebook group if you’re not sure what to do. I pledge to publicly refuse to eat animals, to sit with others where animals are being eaten and encourage others to take the pledge. If you are vegan, how long have you been vegan? How did you find out about this pledge? Why are you taking this pledge? Your comment may be posted publicly. Thank you for taking the Liberation Pledge.